As a company that provides high end kitchens, bedrooms, studies and freestanding furniture it is not uncommon for our clients to seek finance options in order to make a purchase. One of our customers was recently approved for a substantial loan — had they not made this application through Ideal4Finance we may not have been able to provide our services. The process was very quick and our client received the loan without any fuss. Both our customer, and ourselves, are very pleased with the service from Ideal4Finance. We have been using Ideal 4 Finance around 11 months now. Knowing that we needed a finance facility to sell our products. I was very sceptical at first on how it works, but I must say it has without a doubt the best thing that I have done for my business, as it has allowed me to offer finance in the simplest of ways, increasing my sales dramatically. I would have no hesitation whatsoever in recommending this company to anybody. We are happy with Ideal4Finance. Signing with them has really helped our clients find finance. We also find them lovely to deal with and work hard with our clients. × We have received your details and our brochure is on its way, please check your e-mails in the next few minutes. If you would like to discuss how Ideal4Finance can help transform your business with a hassle free finance facility you can call our sales department on 020 3841 2820. More customers, more sales, more revenue! What happens when you don't offer finance? Well, it won't affect customers who have the cash to do business with you, and that's great. But what about the many people out there who would love to buy your goods or services but simply don't have the available money up front? The answer is they find a competitor who DOES offer finance. Every time that happens, you not only miss out on their future business; they tell their family and friends that your competitor offers finance, not you. Put simply, without a finance facility. No serious business owner chooses to avoid attracting new customers. Being able to offer finance is one of the key ways you can appeal to everyone – not just those with cash. And if you thought it was a complex, time consuming process think again. 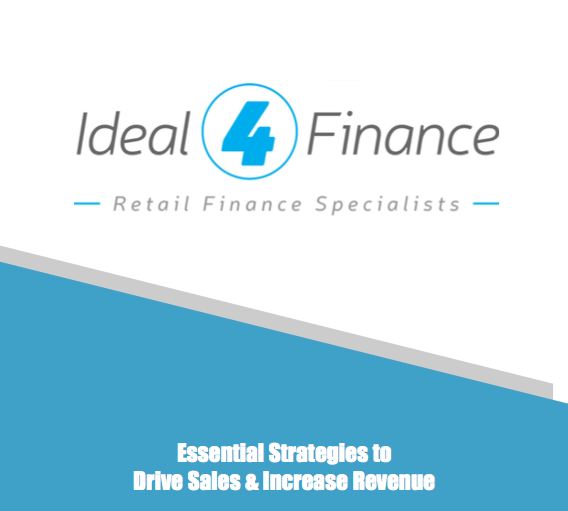 Here at Ideal 4 Finance, we've made providing a bespoke finance solution for your retail customers a painless option. Ideal 4 Finance can negotiate secured and unsecured finance for almost any purpose. Maybe your customer wants to spread the cost of their purchase, or allow them to purchase those expensive items that they simply don't have the available cash for. How many people can simply go out and buy a new kitchen, a new sofa, replace the broken boiler, get that new family car, a home extension or even cosmetic surgery? 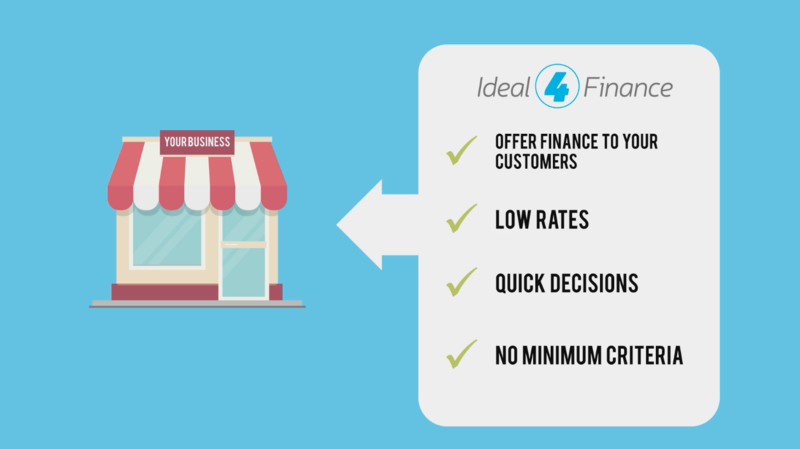 Ideal 4 Finance makes it possible for your customers to purchase the things they need NOW and ensures that it's you that gets their business – not your competitors! Why wait to offer finance when we can get you set up in no time? All we need to do is register your details, and you are ready to let your customers apply for finance. We've put together a really helpful and informative guide on why finance can give your business an advantage, and attract new customers. If you still aren't sure whether offering finance facility is the way to go, this should help you decide. Download it here. If you want to talk to us to find out more about Ideal 4 Finance, we are just a phone call away. Contact us on 020 3841 2820 and we'll be happy to help.